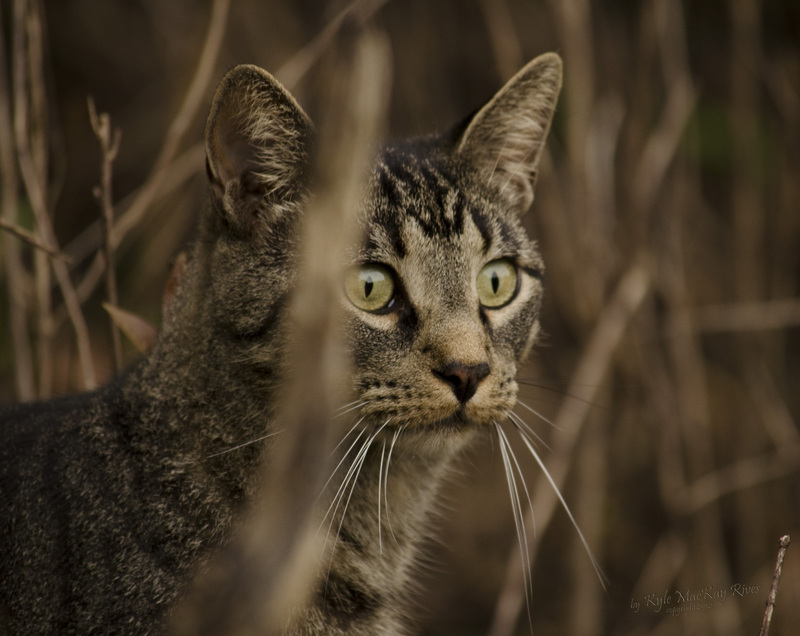 The cats like to go out with me to take photographs, but they are ever watchful. Apparently, they are cognizant of the danger of becoming lunch for a coyote! This photo of Tiger as a watchful, intensely focused cat contrasts strongly with his usual totally laid back, flopped on his back, rag doll cat demeanor when in the house. This entry was posted in Pet Portraits, photography and tagged cat, outdoors, pet, pet portrait, photo, Photograph, Photography, Tiger. Thank you. Tiger completely agrees with you! I have 3 cats who are complete love bugs – floppy and purring and all over me. However, I love those moments when their inner feline wildness comes out full force, and they look like the wild animals they are inside. You’ve captured that beautifully in this photo! Gorgeous. Thank you 🙂 Tiger loves his wildness, too, and goes out with me and the dogs on long walks. He will see one of the dogs coming and hide behind something, then jump out and surprise the dog as she runs by. Very entertaining!